Auto Tasks are MyEDiary's way of automating common workflows. An example of this is creating a homework task that is set to be assigned on a regular schedule. This is particularly useful for repeating or recurring tasks, such as Maths homework that is due every Friday. Rather than a teacher having to copy a previous task or manually create a new one every week, using Auto Tasks to create and assign the Maths homework means that it only needs to be created once and the teacher can then choose the schedule on which it is assigned to their class. How do I create an Auto Task? A new Auto Task can be created from 3 places within MyEDiary. 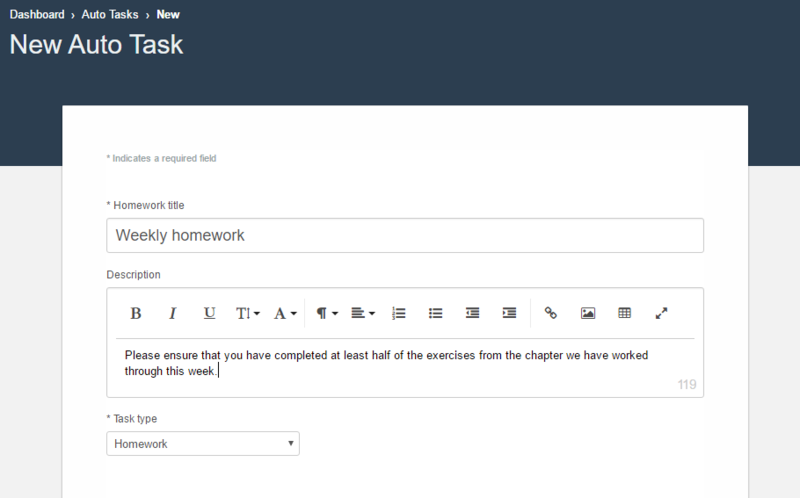 Just as you would with a normal homework task, enter a name, description (not mandatory), and label it with a task type. In this example, we want the homework to be due for students every Friday. Select Change schedule from the Select a schedule drop down. Then change the frequency to weekly and choose the Friday as the day in the week it will be due. A summary will be shown explaining the schedule you have chosen. Click OK to confirm. Then using the 'Schedule starts' and 'Schedule ends' fields, choose the date range in which the automation will be active. In this example I want the homework tasks created to be due every Friday in Term 2, so I choose the start and end dates for Term 2 this year. Now we choose how many days before each task is due that it should be posted in the student's eDiary. A summary will show below this detailing when the next homework task created by the automation will be due. Now choose the class(es) the homework task will be assigned to and fill in the other options as required. Read our guide on How to assign homework for further information. Once you have set the Auto Task up exactly how you want it, click the Create Auto Task button. 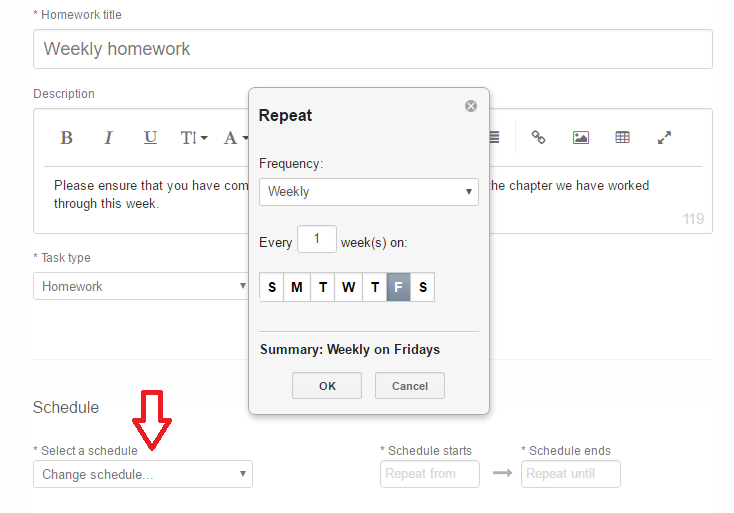 Now the Auto Task is ready to create and assign homework on your chosen schedule!